Today is Thursday and I am little bit excited today. I will hear good news from my student who took real TOEIC test last month. I have expected that he will get over 730. Besides, I knew his skills and level. He is my student and his name is Tetsuya, he is older than me. likewise, he has good personality and attitude. When I met him first time he was a bit rude and impolite. When I got the chance to know him well, I realized that I was wrong about my first impression. Well, the good news was delivered early and he gave me a big smile. Finally, he has big dream and before we always talk about his plan about teaching English in College. I have been inspired about his life story for the reason that he became manager and got the highest position in the company as CEO. Aside from that, he worked with some big company. I have also heard that he has 4 major and he studied English many times. 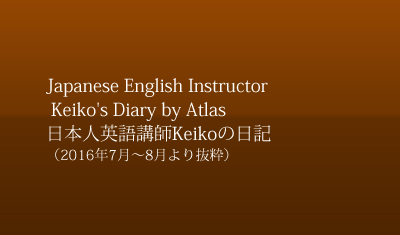 Moreover, he visited many places as well and he told me that he loves Atlas and our lesson style. Then, he became more closer to us than other races. Furthermore, he told me about opportunity to work in his hometown but I told him the chances of working abroad are not enormous. On the other hand, I am not sure to go or work in another country and I am so thankful he made it well and I knew he will be a good role model to everyone. Thus, A good friend and a smart student deserve to be happy in his or her future.